Compass 82 was deployed to Florida following Hurricane Irma to streamline recovery efforts by providing guidance to disaster survivors and various agencies throughout the state. Our extensive experience, expertise, and comprehensive resources played a key role in the expedited formation of long term recovery groups and recovery plans for individuals and communities. 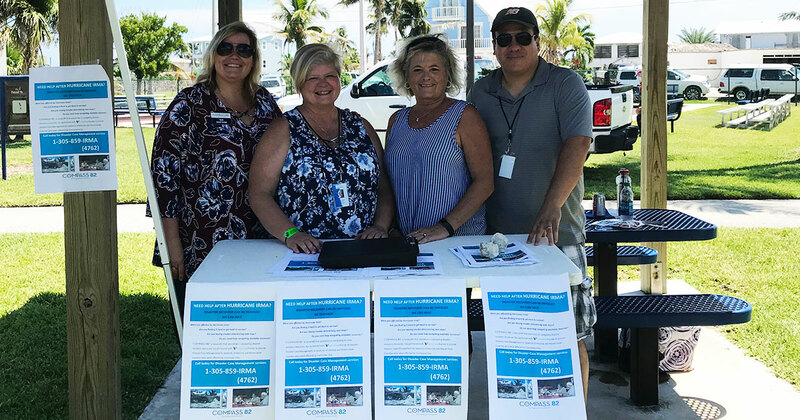 Our collaboration with government entities, nonprofits, and volunteer organizations jumpstarted fast and effective recovery processes for several counties, including Miami-Dade, Monroe, Duval, Nassau, and Putnam-St. Johns. In April of 2018, Compass 82 was awarded a 7 million dollar grant by Volunteer Florida, the lead agency for volunteerism and national service in Florida, to provide disaster case management (DCM) services to individuals of the two hardest hit counties. As the DCM provider, our organization has delivered 1-1 support for survivors, establishing recovery plans specific to their needs, ensuring those plans are followed through personal advocacy, and connecting them to the resources essential to their recovery. Compass 82 also teamed up with leading structural moving and elevation company Ducky Johnson Home Elevations to host a series of disaster recovery educational workshops for homeowners, contractors, and builders in Augustine and Jacksonville. April/May 2018: Compass 82 awarded 7 million dollar FEMA-funded grant in conjunction with Volunteer Florida to provide disaster case management services to Irma-impacted residents of Miami-Dade & Monroe Counties. April 10 – 12, 2018: Compass 82 partners with leading structural moving and elevation company Ducky Johnson Home Elevations (DJHE) to host disaster recovery and flood mitigation workshops in Augustine and Jacksonville.